No, I prefer the good old presentation. Create schools & edit their information. Easily add information fields about your school. Setup marking periods, school periods & grade levels. 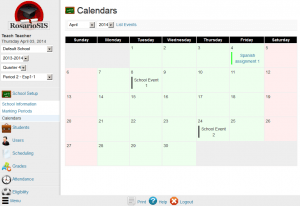 Manage & consult the calendar, including school events & student assignments. Configure RosarioSIS, activate online registration, modules & plugins. Rollover: roll data to the next school year. 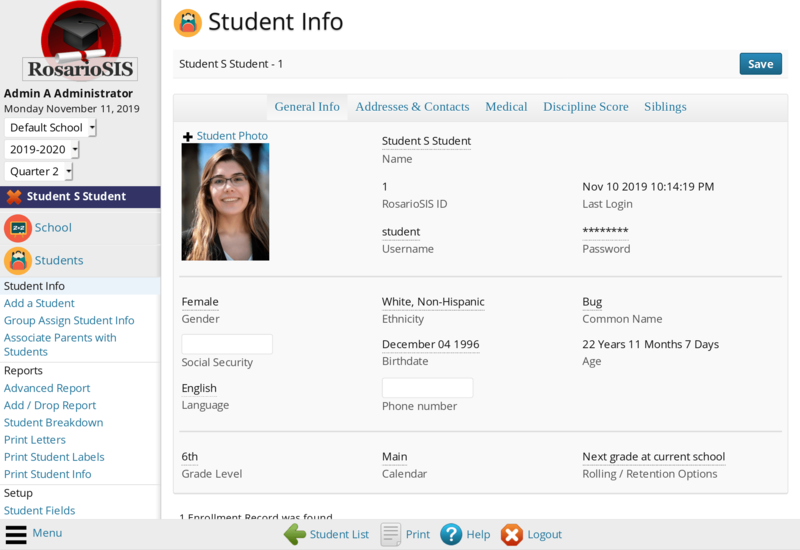 Add new students & edit their information (enrollment, demographic information, photo, addresses & contacts, medical…). Easily add information fields about your students. Print advanced reports & consult statistics. Print formatted letters & mailing labels to contact your students. Create parent users from student contacts. Add new users (administrators, teachers & parents) & edit their information. Easily add information fields about your users. Easily add new user profiles & configure their permissions. Notify parents who never logged in. Possibility to work with requests & the scheduler. Print schedules, class lists, face-books & requests. Consult schedule & requests reports. Spot incomplete schedules & requests. Organize your school’s subjects, courses & course periods. 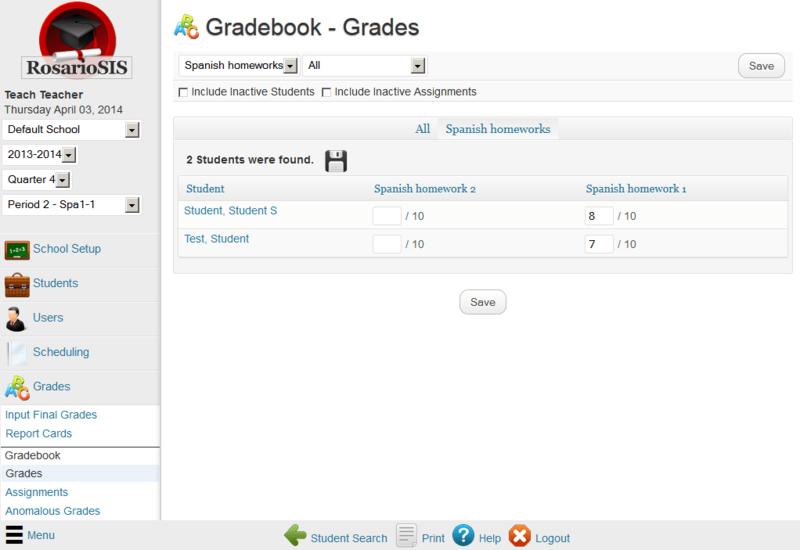 Teachers can create assignments, enter grades in the gradebook & final grades for their students. Print report cards, transcripts & honor roll certificates. Consult reports & statistics on students grades & GPA. 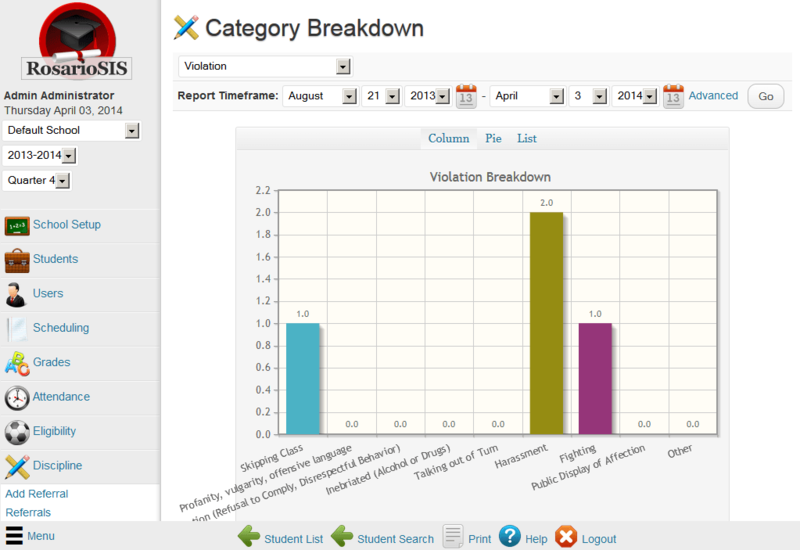 Configure the report card grades & comments. 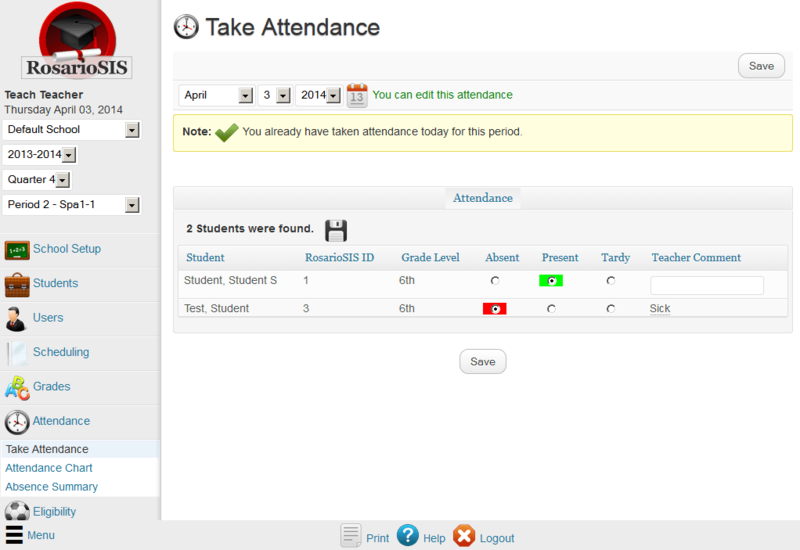 Teachers can take attendance for their students & consult summaries. Consult reports about attendance & teacher completion. 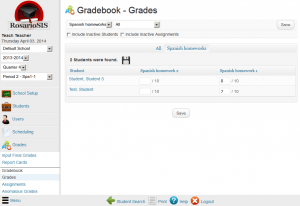 Teachers can automatically report which students are eligible for athletic or academic activities using the gradebook. Consult reports about teacher completion. Add, edit & consult discipline referrals. Manage school incomes & expenses. Manage staff salaries & payments. 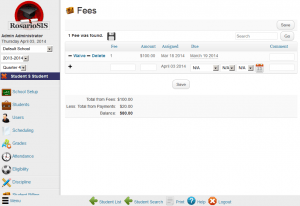 Manage student fees & payments. 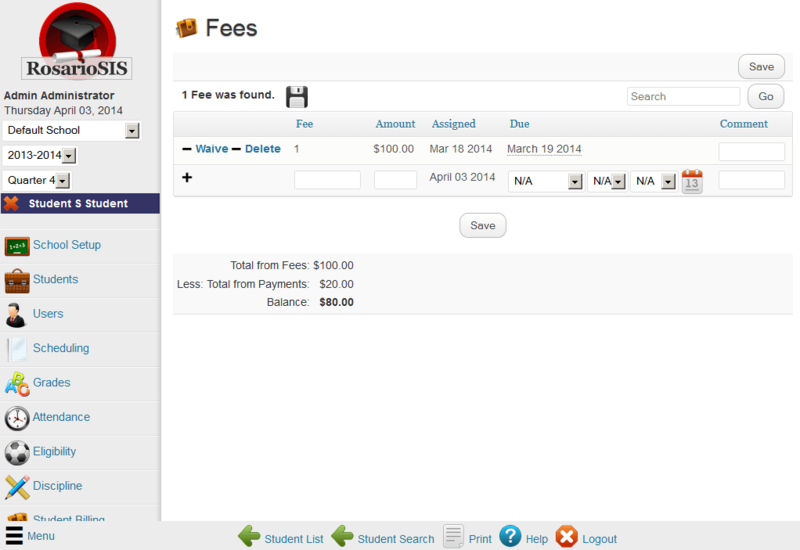 Consult student, staff & school balances, the daily transactions. Create menus, their items & add daily menus. Manage the food service accounts of the students & the staff. Consult activity & transactions reports, print reminders. Students, parents & teachers are automatically created, updated & deleted in Moodle. Subjects, courses & course periods are automatically created, updated & deleted in Moodle. 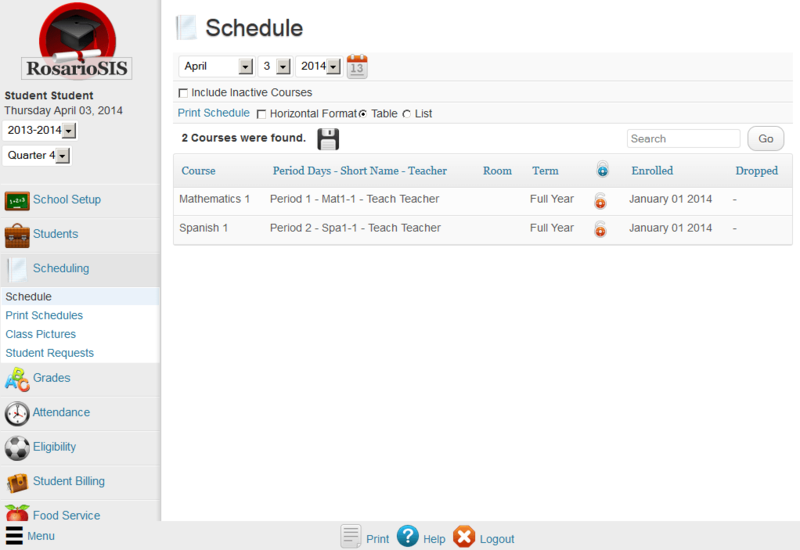 Automatically schedule or drop students from a course period in Moodle. 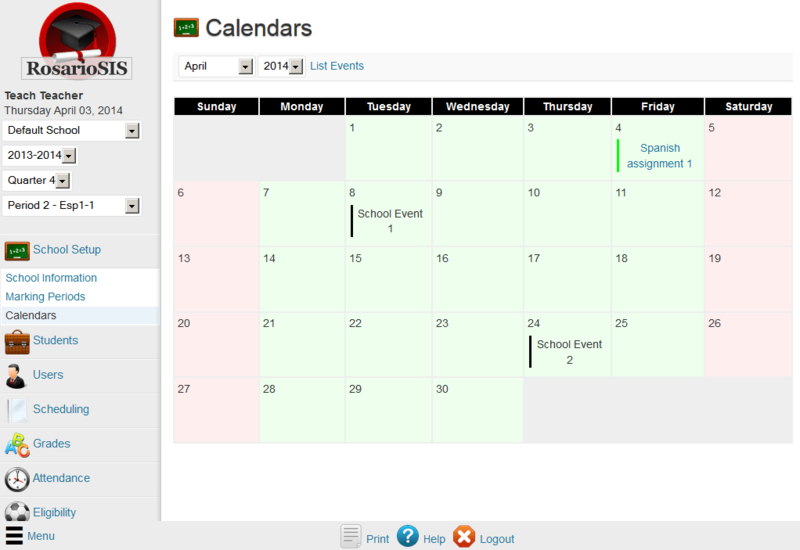 Events & assignments are automatically added to & removed from the Moodle calendar. Portal notes are automatically created, updated & deleted in Moodle. Export listings to Excel, CSV & XML. 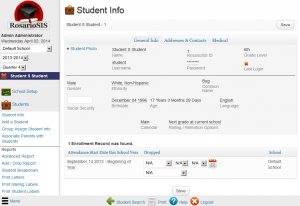 Powerful & customizable student search module. Online users & students registration. Responsive design: compatible with smartphones & tablets. » Quick Setup Guide: step by step RosarioSIS configuration. » Tips & Did you knows for Administrators, Teachers, Students & Parents. » Ask for our Services.